We’re now well over two years into the SEND reforms, and the reform journey so far has been long, winding, and very, very expensive – nearly £500m spent to date, according to information gathered by legal firm Boyes Turner. Just last weekend, another £215 million was announced for SEND facilities and infrastructure. Some of this spending happened before the reforms became law in 2014 – but not all of it. Since 2014, the Department for Education has given local authorities a grant each year to help them implement the SEND reforms. About £180 million in SEND reform grant money has been doled out so far, and another £40 million has been lined up for the next financial year. Where’s this grant money gone? I asked 150 English local authorities how they had spent it. The data they sent provides a telling snapshot of the difficulties LAs are facing in making these reforms work. So far, I’ve managed to track what’s happened to £125m of the grant money – about two-thirds of it. I can’t yet pin down what’s happened to the remaining third. Why not? Well, the information is held at local authority level. To get it, I had to ask local authorities to provide specified & quantified data. Most LAs did provide the information I asked for, and some did so superbly well. But as veterans of the SEND system will know, not every LA is bursting to offer parents specified & quantified data. Some LAs simply weren’t willing to specify and quantify. Embarrassingly, a few said that they couldn’t help, because they can’t actually track how they spend it. One LA told me they didn’t track grant spending, but then issued council minutes a few weeks later showing that they do in fact track it. Not a good look. So who is holding LAs to account for their use of this grant money? Well, this is SEND, so the answer in practice is ‘no-one, really.’ The grant money isn’t ring-fenced – it doesn’t even have to be spent on SEND at all, as long as it’s lawfully spent. As yet, there is no evidence that Ofsted / CQC inspectors are particularly motivated to check that DfE grant money is being used to drive effective improvement. What’s it been spent on? Check the infographic for a guide to where the grant money has gone. Most of the money I tracked has been used to bring in extra staff – about £76m in spending. LAs need extra personnel to make the SEND reforms work – not just to carry out EHCP assessments, but also to convert existing statements and Learning Difficulty Assessments over to EHCPs. So most LAs have drawn on the DfE grants to bolster their in-house SEN assessment teams – extra case officers, educational psychologists, managers, and so on. However, a lot of this investment looks like it’s short term. Nearly half of the spending on extra staff I tracked has gone to people who won’t be sticking around: temps, agency staff, short-term change management teams, and outsourcing. Some LAs have also spent it on getting others to do some of the work for them, via outsourcing. We’ve covered the pros and cons of outsourcing EHCP work to private firms in SNJ before, so it wasn’t a surprise to see that the single biggest private sector beneficiary of the DfE SEND reform grant money was an EHCP outsourcing firm. But it also looks like schools & further education colleges are carrying a large part of the burden of moving to the new SEND system. At least 30 LAs used SEND reform grant money to pay schools & colleges to carry out EHCP conversion work, with many schools & colleges getting received tens of thousands of pounds for the services they provided. All LAs face challenges in getting the SEND reforms implemented, and bringing more staff in to get the increased workload done is absolutely necessary. But there are big drawbacks to relying on temporary & outsourced staff so heavily; when they leave, the expertise and experience they have gained leaves too. It’s one thing to bring more staff in – it’s another thing entirely to make sure that all your staff understand the new system and the new law. And one of the most surprising things about the spending I tracked was just how little of it has gone on staff training. 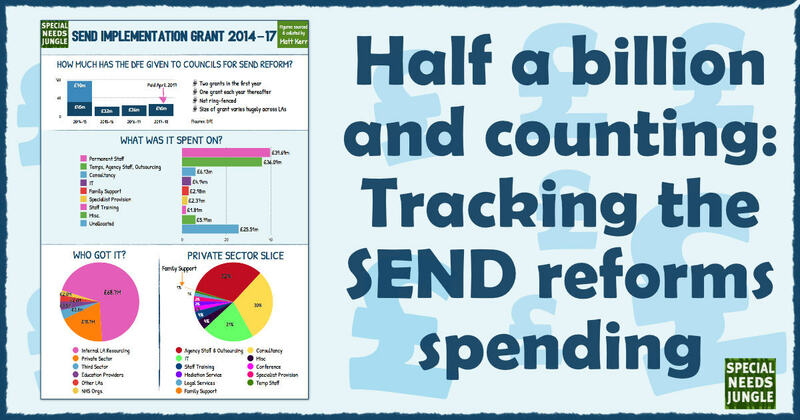 Just 1.5% of the SEND reform grant spending I tracked went on training LA & school staff - about £4,000 per LA per year, when you average it out. That is a bafflingly low figure. These are the most ambitious SEND reforms for a generation. At the very least, staff need to be trained on new law, new processes, and – crucially – new ways of working collaboratively with people. This change in organisational culture goes right to the heart of what the reforms are trying to achieve. And that’s what this DfE grant money is supposed to make happen. If staff don’t get enough training, they are not going to be able to implement the SEND reforms well – no matter where they come from. To add to the fun, five of these LAs used the grant to get trained up by Baker Small – a specialist legal firm that, to put it mildly, is not known for its parent-friendly ways. Looking at the data, one thing that was encouraging was seeing many LAs putting a chunk of their grant money towards improving family and young person support – about £3m in all. Most of this was channelled to established family support groups, like parent carer forums and SENDIASS parent advisory services - but some LAs also used this grant in new ways. Some LAs funded advocacy services for children with SEND. Cornwall used some of its grant money to set up a panel of young people with SEND to feed into and challenge LA SEN services. Other LAs used their grant to experiment with new ways of working: for example, the Achieving for Children consortium in south west London used its reform grant money to trial the RIX Wiki system, a new way of putting EHCPs together that we have covered here on SNJ before. Elsewhere, the sectors who have done well out of the SEND reform grant bonanza are pretty predictable. Over £6m has been spent on consultancy, for a wide variety of purposes. It’s really hard to tell what impact or benefits this consultancy spending has had – your mileage will vary greatly depending on who your LA has used. Most of it went to unnamed individuals, payments typically in the thousands and tens of thousands, with at least a few lucky winners bringing in £500+ per day. IT firms also did reasonably well out of the SEND reforms – at least £4m of grant money was allocated by LAs to IT projects. Most of this went on website development for the Local Offer, or on new document management systems. If your Local Offer website looks lovely, there’s a good chance that this grant made that happen - what’s on the Local Offer website, of course, is another matter. And predictably, a few LAs dipped into their SEND reform grant to pay for legal defence against parents. At least eight LAs used part of their grant to fund SENDIST Tribunal casework. Hertfordshire spent £125,000 of their grant on SENDIST Tribunal expertise and support – whilst at the same time, they also spent just around £5,000 on a project ominously titled ‘parental resilience.’ Resilience against what isn’t too hard to guess. Northamptonshire appear to have spent a large chunk of their grant money on barristers. Croydon spent £95k of grant money just on preparing the ‘bundles’ of documentation for their SENDIST cases. And Lewisham have used over £70,000 of DfE grant money to fund SENDIST casework – paid to a private firm that appears to be part-owned by the head of a neighbouring LA SEN service. Which, I suppose, is ‘person-centred’ – but probably not in the way that the architects of the SEND reforms had in mind. It’s easy enough to pluck teeth-grinding statistics from this data. Local authorities spent 2.5 times more of their SEND reform grant money on consultants than they did on actual specialist provision. Just 2% of the grant money has gone to NHS organisations - even though better joint working with health is what these reforms are supposed to be all about. And, yes, some LAs are far too keen on holding catered meetings in well-appointed hotels, and using former managers as well-paid consultants. At the same time, it’s important to remember what grants on this scale can and cannot do. These grants can’t make up for cuts to local authority funding – and the reform grant money isn’t anywhere near enough to cover all the extra SEND duties that local government is now responsible for. The SEND reform implementation grants are now running at £40m per year, a sum spread across all LAs. SNJ columnist Barney Angliss recently estimated that the extra costs for post-19 statutory SEND provision alone could come in at £500m per year. A £40m grant simply isn’t going to make any sizeable dent in that. So it’s unfair to expect LAs to plug every single hole in their SEND provision with the reform implementation grant money – it simply doesn’t stretch anywhere far enough. The SEND reform grants aren’t particularly aimed at that – although another DfE grant, announced a few days ago, certainly is. On the other hand, the SEND reform grant money could – and should - have gone a long way towards changing organisational culture and ways of working in local authority SEN teams. Arguably, that is exactly what is needed for the SEND reforms to work, and it is exactly what the grant is aimed at. And yet, so little of the SEND reform grants have been spent on things that are vital for change to sink in and make a difference at local level. Big sums of money have gone on bringing extra staff in; tiny sums have been spent on training them up properly, and many staff have been brought in on terms that mean they won’t be staying. It’s nigh-on impossible to change the culture of an organisation for the better that way. Parents and front-line professionals who’ve experienced both the old and the new systems often comment that in many respects, things haven’t changed that much since the SEND reforms arrived. The processes are different, sure – but in too many local areas, organisational practice & culture just hasn’t changed that much. The same unlawful LA tricks of the trade are being applied to EHCPs, just as they did to statements. All too often, young people and their families are not brought into the heart of the process. The SENDIST legal route still remains the final arbiter in far too many cases. And if a recent survey commissioned by assessment unit shifters GL Education is any guide, there is still a very long way to go before many classroom teachers grasp what the SEND reforms are all about. The SEND reform grant money could have gone a long way towards changing that. By and large, it hasn’t. And that’s more than a pity, it's a tragedy. You can see a simplified infographic below that you are welcome to share or download and print. To see the actual figures, click here for an Open Data Spreadsheet (multi-format compatible) or here for a pdf. All the more reason why they should NOT be misspending the way many so clearly have been!! Thank you for this article. Human nature being what it is, unless there is statutory instruction on how to spend the money and keeping it separate, as well as being explicit about how it’s spent, LAs will continue to behave this way. As you infer, what’s the point in having more staff, if it’s just more of the same unlawful and heartless way of running things. Clearly Rutland Council represent many LAs who are also extremely economical with the truth. The single biggest shock in this to me, is that they have used these grants for lawyers to fight parents and the sums they have used to do so. Beyond disgusting.